In the last few weeks, we talked about the importance of slowing down and being present, getting down at your child’s level, listening with our eyes, following your child’s lead and how to become an interpreter. 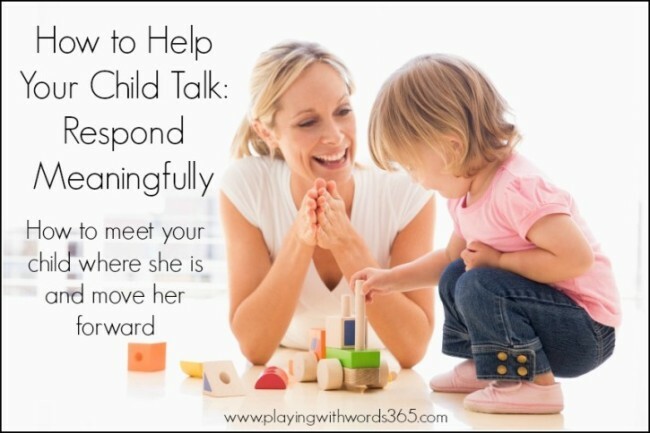 Now that you are starting to put these into practice, it’s time to respond meaningfully to your child’s message. But how? There are many ways we can respond to our children’s communication attempts, and I am going to go over some of these briefly in a moment. But first, let’s talk about how to respond meaningfully by meeting your child where he is and then giving him just enough information to push him to the next level. In the fields of child development and education, we have some fancy terms for this like Scaffolding and The Zone of Proximal Development. The basic explanation, is that the zone of proximal development is the difference between what a child can do by himself independently and what the child can do with some help from us (scaffolding). This is sometimes referred to as the instructional level, the area in which instruction should take place to learn a new skill. You can read about the ZPD in more detail on Not Just Cute. The gold (or yellow) represents how and what your child can communicate independently. These are the things he has mastered like the vocabulary he knows and how long his utterances are (2 words or three words for example). 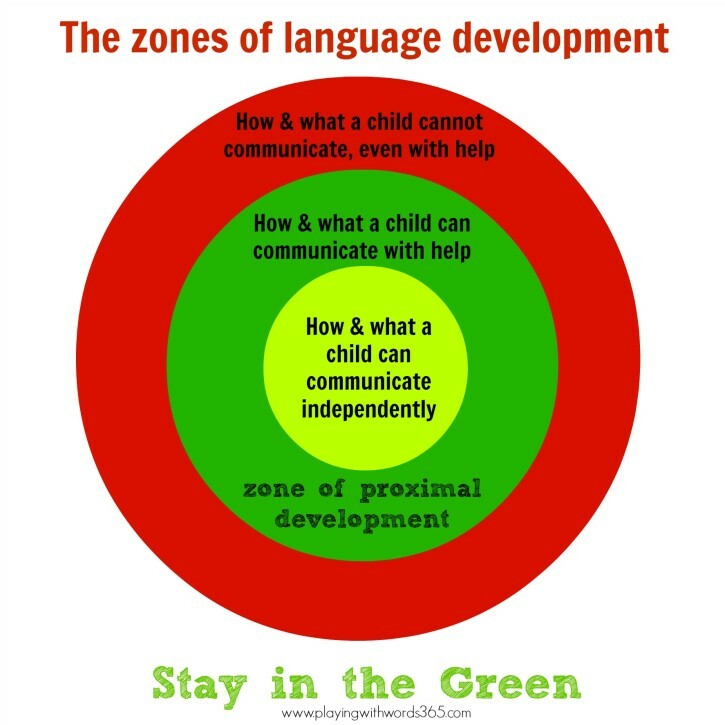 The green represents how and what your child can communicate with a little bit of help. This is the area we want to be in when working with our children, especially those with speech and language delays. We meet them here, give them a little help, and slowly help them expand their gold area. I made this area green as green represents go and this is where I want you to be! For example, if your child is speaking in two word phrases, you would be modeling three word phrases. If your child knows some animal names, you will model new animal names. You meet him where he is and give him a little more information to help him along. The red represents the how and what your child cannot communicate, even with help. These are language concepts that are too advanced for your child. I made this red as this is a no-go-zone. Spending time here will only frustrate you and your child. My friend Kim from Little Stories gives some great examples of working in the ZPD. I encourage you to check out her post as well. To find your child’s zone…you need to use those interpretation skills we talked about. You are watching and listening to your child and interpreting his messages…take note of these messages. Is he sending them with only body language and no words? Then go one more step and use one word to model. Is he using two words at a time? Model three word sentences. Does he know some animal names but not others? Model the animal names he doesn’t know. Does he know some locative concepts but not others? Show him and model the concepts he does not know. Now, you do not have do this all day every day. Your child likely can understand much more than he is saying, so you need to continue to model longer utterances within your day as well. The times you really want to work within is ZPD are moments when you are really trying to teach him new things. More detail on ways to respond will be coming up soon! In the meantime, you can check out all my other tips HERE.